Since the LVO 2018, we've been working on some projects to help facilitate a smooth and enjoyable tournament experience for the LVO and the ITC in general. As the global community of organized 40k players continues to grow, the needs of the participants become ever more sophisticated. It's exciting to see things develop and evolve in this regard! Each season we take steps forward in both growth of participation and in offerings. We also want participants to have the most enjoyable experience possible at the LVO - or any ITC event - and so desire to get these out for you with plenty of time before the big event. As always, participation in the ITC at local events does not require any of the following, but we provide them as tools for those TOs that choose to use them at their discretion. Check with your local organizer for information on how the guidance presented here will be implemented at your local events. Part of the tournament process is establishing baselines, such as baselines for participant conduct, baselines for terrain interpretations, as well as guidelines for the awesome new list uploader the fine gentlemen over at BCP have made for the community! Here's the document for you to use as your list basis, and below is a great video explaining how to use it! Your list must be uploaded for the LVO 40,000 Championships no later than 7:00pm PST, Friday the 25th of January, 2019 through the Best Coast Pairings app. No new rules materials will be allowed into the event that are released on or after January 8th, 2019. The deadline to submit ITC Scores for this season is 11:59PM EST on Monday February 4th, 2019. Events after this point will not count for scores in the 2018 ITC season. We're also rolling out our ITC Code of Conduct. This document is a guideline that has been built through the contributions of hundreds of Tournament Organizers from around the world with the aim of standardizing sportsmanship expectations - and what will happen if they are violated. These standards apply at any ITC events that choose to use them, and while discussing punishments and penalties is never fun, the goal is to provide a clear system of expectations so players can come to events confident that they will have a fair and an enjoyable experience. Terrain is one of the most important parts of a miniatures game, but one that is sometimes tough to standardize since so many of us have slightly different terrain interpretations based on local traditions. Additionally, as we have terrain that in many cases is significantly different than what players may be used to in their local areas, we wanted to roll this guidance out to set a common understanding for how we choose to play terrain at the LVO in order to facilitate fun and fair games. You can read the LVO/ITC General Terrain Guidelines here. We also plan on having guides for terrain placement at the LVO available for attendee reference, with further explanations to make it easy to focus on playing the game and not figuring out how the terrain works. The guideline linked above will be in place, and we have included some illustrative examples to help clarify intent in the article content below. The content below is not the whole thing, so make sure you read the whole document! Units with the Fly keyword may not end their movement inside of an Enclosed Ruin unless they would normally be able to pass through the walls of a Ruin if they did not have the fly keyword, such as Infantry. There are some rule interactions that create bad play experiences with models trying to fly into an enclosed ruin without this clarification. For example: Per RAW, a Flyer (such as a crimson hunter) would be able to end its move inside of an Enclosed Ruin if it completely fit inside, seeming to fly "through" the walls of the ruin unharmed. This causes frustrating model placements and abuses of the wobbly model guidance, and is not the intent of how our terrain is meant to be used, and is the reason why this rule is in effect. Here is an example of an Enclosed Ruin we typically use. These are not Enclosed Ruins because the walls and roofs do not form an enclosed space. If in doubt, discuss it with your opponent prior to playing the game and, of course, you can always call a judge. Some of our buildings have natural openings in them that are quite large. If a model can naturally fit in to a ruin with such an opening, they may enter regardless of unit type. 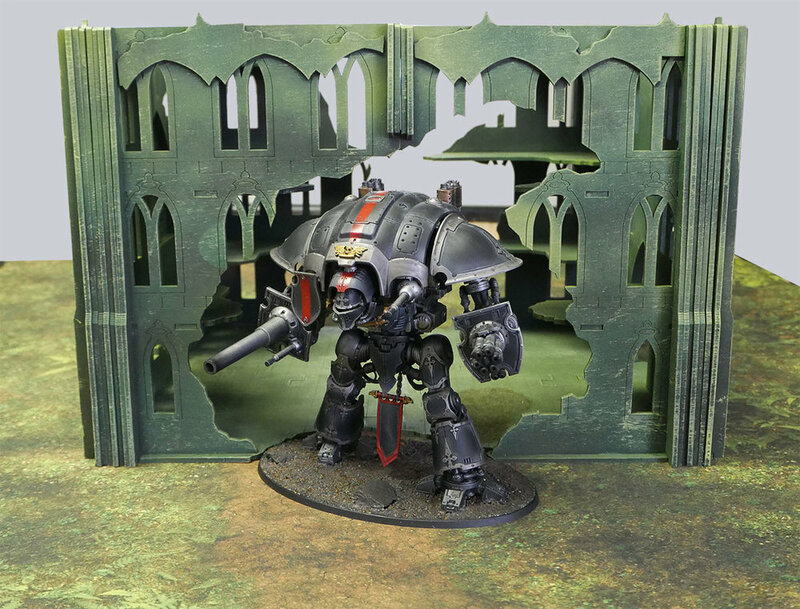 Example: the Knight in the picture below can actually walk into the Ruin in question and can therefore enter into it as it is not moving "through" the walls. Additionally, there has been some confusion in the past on what types of buildings can be entered into versus which ones cannot. 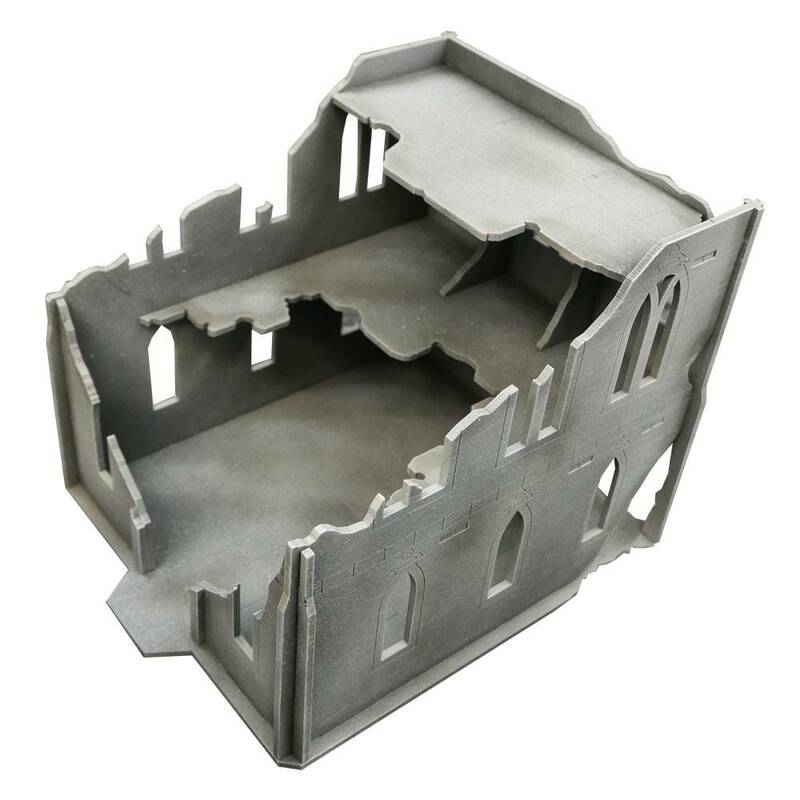 The above buildings would be treated as Enclosed Ruins and can be entered by units that can typically pass through the walls of a Ruin such as Infantry. 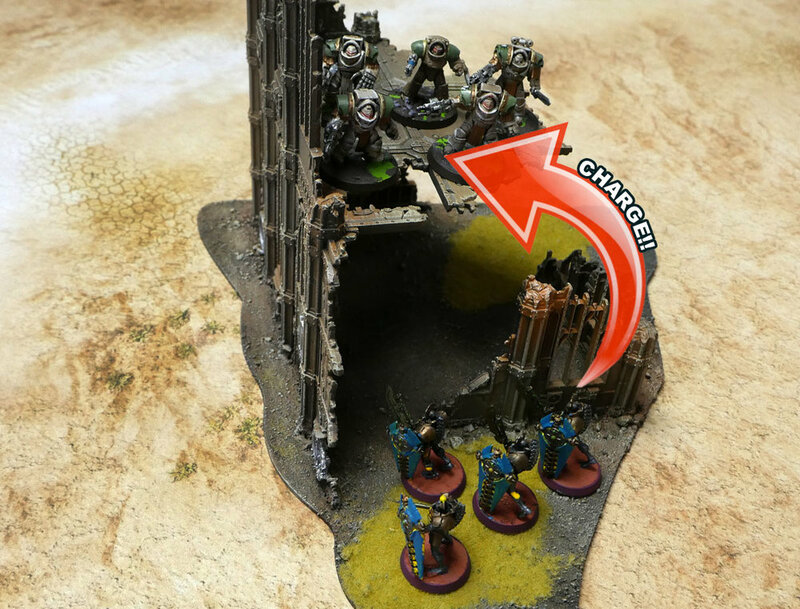 If the terrain piece has doors built into it, it is intended to be able to be entered by units that could typically enter a ruin. They've been designed to have a removable top but when you have a volunteer corps building them, they sometimes get glued together on accident. 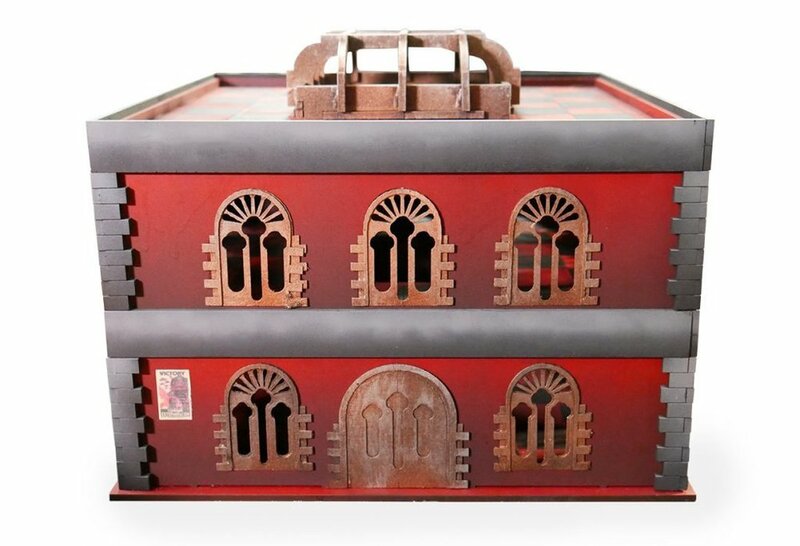 In the case you can't put models inside of them because the building has been glued shut, or simply don't want to bother with opening it up, place the models on the roof and declare where their actual position is to your opponent. Terrain pieces such as the one above lacks any doors and is not intended to be entered into. Treat them as impassible terrain. Our second (and final) modification to Ruins is one most of you are already familiar with, but one we wanted to add some clarification to. We treat the openings on the first floor of Ruins as being opaque, even if you can actually draw LoS through them. This is for windows or openings that are fully enclosed, not partially open on one side. 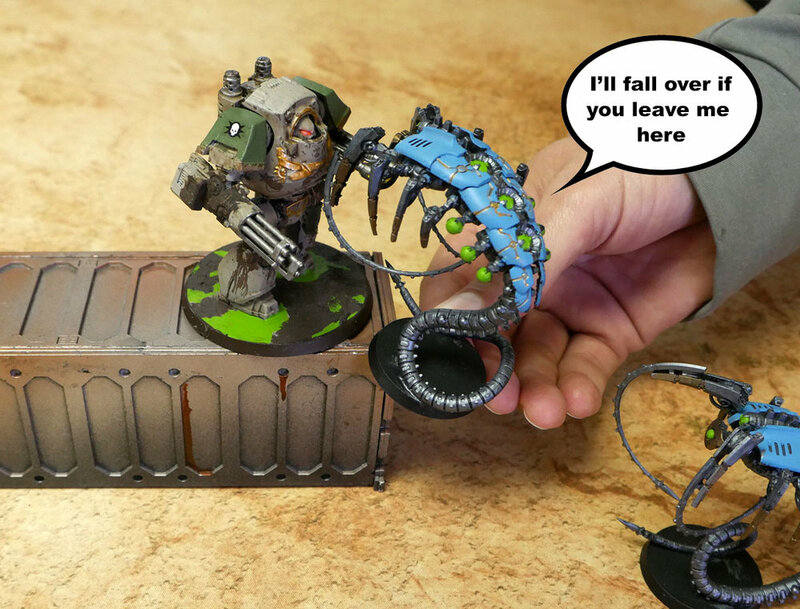 Again, this is a deviation from the BRB but we choose to play them this way as much of the terrain we have has openings in them which (if played with true LoS) would not provide a sufficient amount of cover for a fun and fair 8th edition game of 40k. The openings are entirely on the bottom floor. The openings are enclosed on all sides (i.e. it is a whole window frame). 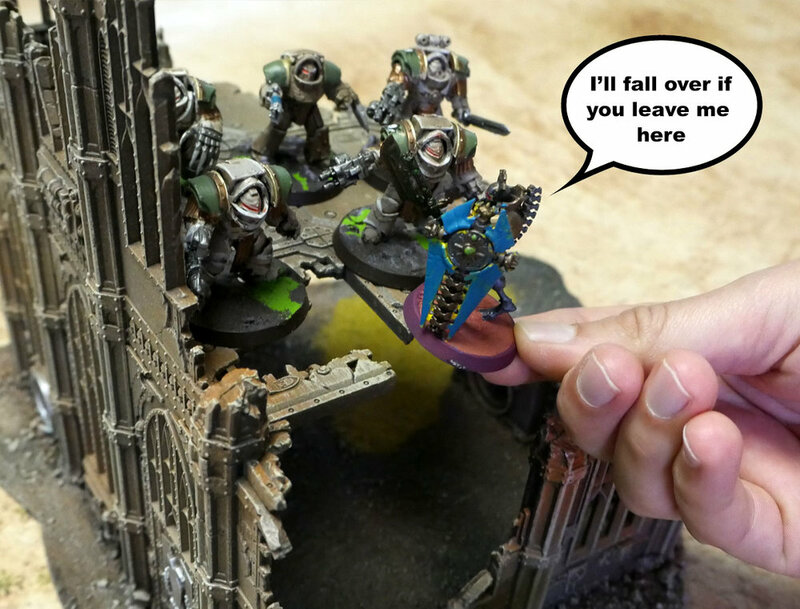 Due to the nature and amount of multi-level ruins we have at the LVO, we chose to use a different method of assaulting into them than is presented in the recent FAQs. This is a conscious choice to deviate from the FAQ in order to facilitate smooth, more enjoyable games. We included a few pictures to help illustrate these concepts. The Lychguard declare a charge against the Terminators, roll for it, and can make the charge with the distance rolled. However, the models won't stand on their own without falling. Place the models as close to their true position as possible and then count those models that would have been able to make it within 1" of enemy models (assuming part of their base could have fit on the upper level) as being in combat. Those models that would not make it up a level would not be able to attack in melee as they would not be within 1" of an enemy model or a friendly model within 1" of an enemy model. We have a LOT of Cargo Containers at the LVO. Like, hundreds and hundreds of them, haha. So, it is important to be clear on how to correctly use them. We treat Cargo Containers as hills for all intents and purposes. It occasionally comes up how to complete Charge actions against models standing on them. In the instance a model rolls high enough to make the charge, but their model won't fit on the Cargo Container, simply place the models as close as possible just as you would with a normal hill. These terrain features are common at our events and not intended (or designed) for models to be placed on them (typically models cannot stand on them). Treat them as impassible terrain. Huge thanks to the literal hundreds of people that contributed to this! It wouldn't be possible without everyone's help and input. Let us know if you have any questions in the comments section below and we look forward to hosting you at the biggest and best LVO yet!